I'm not surprised, however, I'm still somewhat disappointed with the new Fright Night trailer. The remake (yes another remake) was a long shot, but the differences are stark. 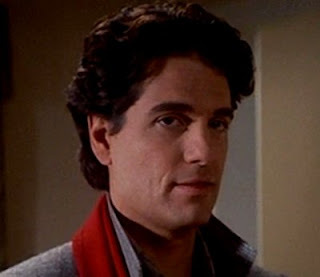 The original film's Jerry Dandrige was an ultra-elegant, centuries-old vampire, creepily played by Chris Sarandon. Chris Sarandon scares me without the vampire makeup. In the remake Jerry is played by Collin Farrell and they all "live" in Disturbia or what appears to be a Las Vegas surburb. If only Shia LaBeouf were here it would be a perfect storm. Anton Yelchin (of Star Trek) plays our fearless hero Charley Brewster and Toni Collette plays his mom, Jane. There were a few good scenes in the preview when Jerry exacts his revenge, but we're missing a key element from the trailer, and that's David Tennant. David plays the indomitable Peter Vincent, made famous in the original film by Roddy McDowall. Perhaps it was the absence of Peter Vincent that made this preview fall flat. Did I mention that Peter Vincent is now a hybrid of Russell Brand and Chris Angel, instead of the professorial-vampire hunter-extraordinaire? The film releases August 19, 2011, so I will reserve my scorn until then. I hope to be proven wrong. Perhaps this is the Fright Night for the next generation and the rest of us have been left behind. It's really hard to watch our favorite childhood films ripped apart piece by bloody piece. The original was so awesomely 80's that it would have been a hard sell, but alas, I wanted to give it a try. One positive note is the director, Larry Gillespie, who previously directed Lars and the Real Girl and the 1st season of the United States of Tara on Showtime. So this could just be a bad preview, which is my hope. Amazingly, the original preview still stands the test of time. I hope to be proven wrong too. It makes me sad that they remade this...it doesn't seem ANYTHING like the original and Collin Farrell as Jerry?? Nooo. Chris Sarandon was so smooth & attractive...if anything why not someone new to be Jerry?? Or even Alexander Skarsgård, just dye his hair a darker color & ta da!! But hey, what do I know?? Yeah the trailer left me speechless and not in a good way. Even when they do these remakes I still check them out to either fuel my hatred more or maybe win me over. However few have. That David Tennant pic reminds me Dave Navarro now lol. oh well it's a wait and see for now. @Real Queen of Horror - If you were in charge, then we'd have a good movie. Alex Skarsgard would have been perfect or even a newcomer. But Collin Farrell? I guess he has a bad boy reputation, but like you said Chris Sarandon was so smooth. @slowd77- I agree. If the film receives halfway decent reviews, I will begrudgingly go see it, but if gets blasted, I think I'll rent the old one and make my own bowl of popcorn. That reminds me, I really need to have an 80's horror movie night. Great post, my thoughts exactly. Give me Chris Sarandon any day. I can handle 80s cheese. Perhaps it's the nostalgia?